Have you seen these? 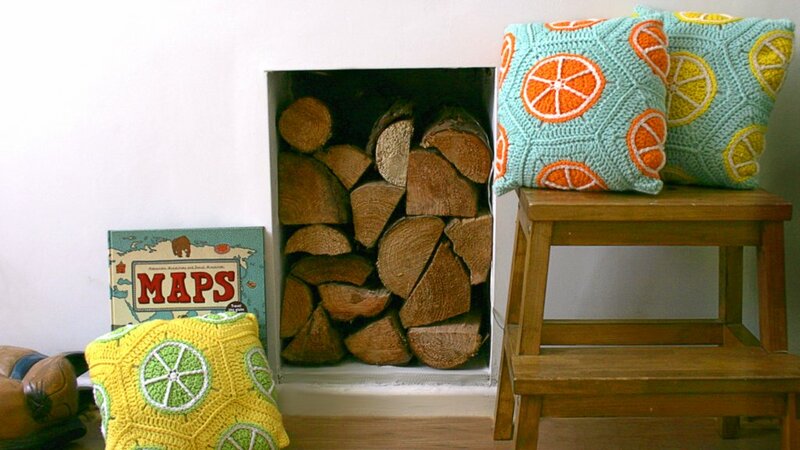 They are my Citrus Cushions from 75 Colourful Hexagons to Crochet and they are the best cushions in the house! 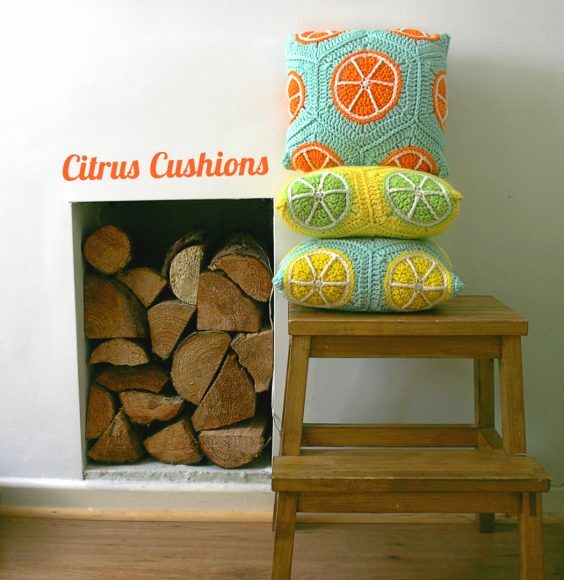 Everyone loves these citrus cushions and can’t help giving them a mighty good squeeze. They are bright and cheerful and really add a sploosh of colour in my kitchen. The cushions are one of the projects in the book and there are three colour variations to choose from: Orange, Lemon and Lime. The finished cushion covers will fit a 14″ pad. I’ve used Cascade 220 to make them which is a lovely worsted weight wool yarn. It’s one of my favourite yarns to use because there are so many gorgeous colours to choose from. You can use any worsted weight yarn though or DK weight for a 12″ cushion. Each citrus shape is edged to form a hexagon. Then the hexagons are joined together to form the citrus cushion. 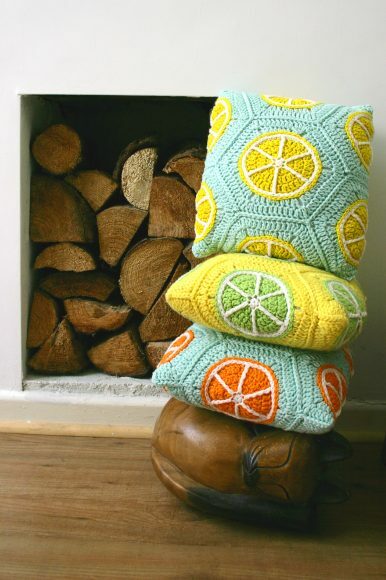 I really love my cushions but I think a citrus blanket would be a fun project to make too. I’m also planning on using the citrus centres of the hexagons to make matching coasters. Then all I’ll need is the punch and paper umbrellas! Where is the Citrus Cushions pattern? Its in my book; 75 Colourful Hexagons to Crochet. You can buy online from Amazon.com and amazon.co.uk. Check out my book page for more info on where to get a copy of the book and who publishes it in different countries. 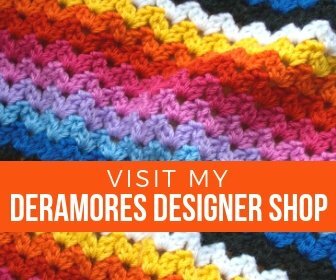 I’ve added the pattern to the Ravelry database so if you’re hooking a cushion of your own be sure to add your project on Ravelry. I always love seeing what people make with my patterns. 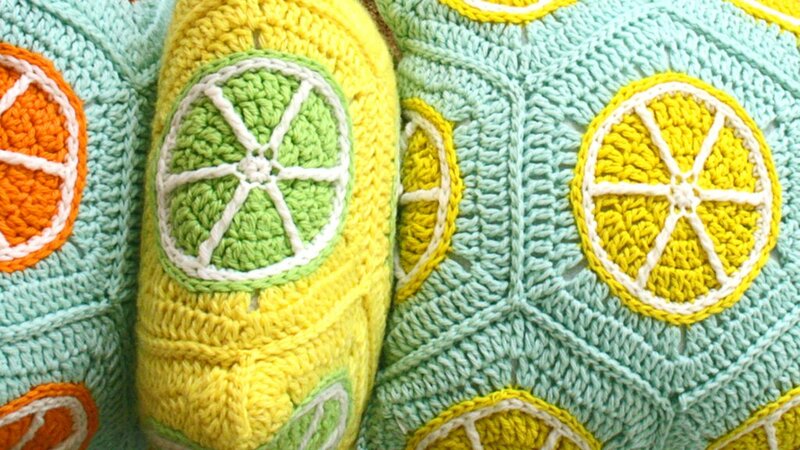 The pattern name on the database is Citrus Pillows, not Citrus Cushions. Oh, the pitfalls of international publishing! Hope you enjoy the book and Happy Hooking! Flower Blanket Design for Tracey’s BookRipple Scarf – Pattern release!